Terry and I have a new kitchen gadget…er, appliance. We were looking into air fryers, so I checked with the good folks in the Yahoo Kitchen Appliances group. I was told, quite clearly, to forget the air fryer and get a NuWave oven. 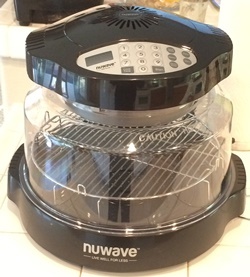 They said the NuWave Oven would do much more for much less money, as it combines conduction, convection, and infrared cooking. Terry and I went to Bed Bath & Beyond to look for one. They didn’t have the oven in stock, but I ordered it. I had my 20% off coupon in hand, they gave us free shipping, and it was shipped directly to me. It arrived on Wednesday. I tried an air-fried panko chicken recipe that evening. Marvelous! Crispy on the outside, moist on the inside. Thursday I used it to make my roasted mixed nuts. It worked great and I didn’t have to heat up the oven. I’m not much of a steak person, but we made a pepper steak with sirloin for Thursday dinner. One half of it was thicker than the other, so Terry got her preferred medium and I got my preferred well-done. Very tasty! For Saturday dinner I made grilled salmon with basil. The salmon was moist and quite delicious. On Sunday Terry made a marinated Thai pork tenderloin. It was tender, moist, and full of flavor. We’re sure to get a lot of use out of this thing. Glad you like your NuWave. I have two of them and am one of those who recommended getting one.